Being a busy working mom I often put together lunch quickly! 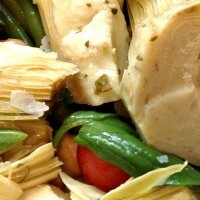 I try to include artichokes in my weekly diet because of their fiber – important for gut health. Here’s a simple salad I’ve really enjoyed using fresh basil and cherry tomatoes from my garden. Place green beans in the bottom of a bowl. Add rinsed artichokes and Garbanzo beans. Wash tomatoes and basil then place as colorful accents.